Charming holiday house in a rural setting located on a small estate 2 km from the medieval village of Chiusdino in the province of Siena in Tuscany. 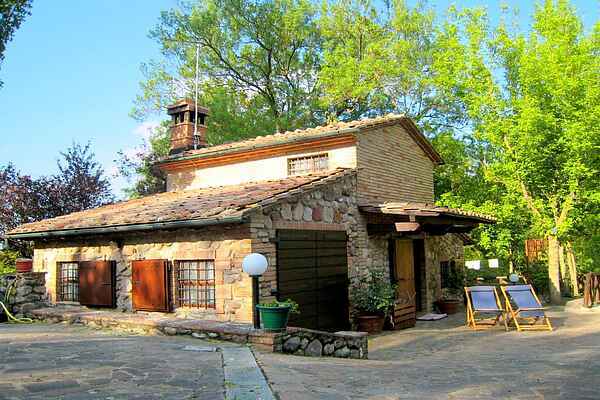 This free standing typically Tuscan villa is built of natural stone and old bricks and has been completely renovated. This rustic villa is tastefully furnished in a typical Tuscan style. The villa has its own grounds (20,000 m2) with an orchard with nut trees which is completely enclosed, making it ideal for house pets. Behind the house there is a masonry barbeque with an original pizza oven where you can enjoy dining al fresco. The garden of the house is lighted at night. The villa is located to the southeast of the city of Siena (30km away) and is ideal for day trips to the nearby Abbazia di San Galgano or the towns of San Gimigniano, Volterra, Castello di Montereggioni and naturally the city of Florence. The beaches of the Tyrrhenian coast (Follonica, Punta Ala) are only an hour’s drive away.